The change of the seasons means that all the fancy seasonal places are changing their menus which means that this is the time of year that we'll get invites to eat these new menus. Normally, we say no. 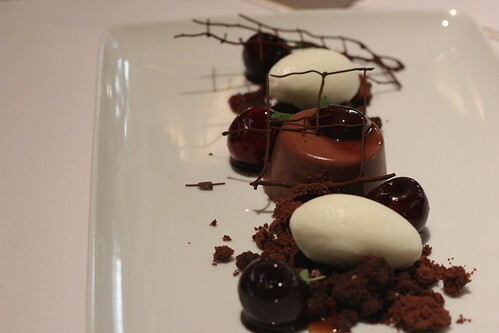 But one of our mutual acquaintances is the sister of the new pastry chef at Gotham Bar & Grill, Ron Paprocki, so when an invite came through to eat some of his latest dessert options, I decided this gratis meal was okay. Also, I never get to eat a fancy places like Gotham Bar & Grill. The meal of four dessert courses began with the Buttermilk Panna Cotta which involves one of my favorite fruits, huckleberries! If you've never had them, they're like blueberries mixed with tart raspberries. Mix that with maple ice cream and an oat crumble I would shovel in my mouth daily if it was for sale, and you have the best dessert that could totally double as breakfast. 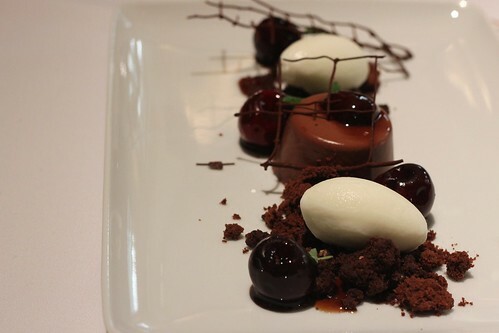 Next came Gotham Black Forest: chocolate crème, chocolate dacquoise, chocolate sable, cherry balsamic and bing cherries, and mint ice cream. I kept imagining this is what Hansel & Gretel would serve at their dinner parties after they've grown up. You know they live large off the witch's jewels. To break up the two rich sweet plates, we were served the Vanilla Semifreddo, a winner for anyone who loves tart citrus desserts. 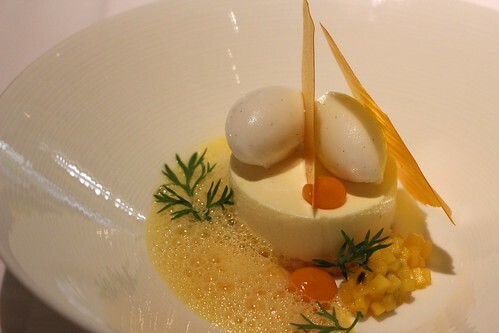 Mango, passion fruit, and coconut are represented in the dish multiple ways and I liked each one, but I loved the sugar glass. Breaking things during dessert is always loads of fun. The tasting ended with the Caramel Chocolate Mousse, the lightest, fluffiest mousse I've ever known. 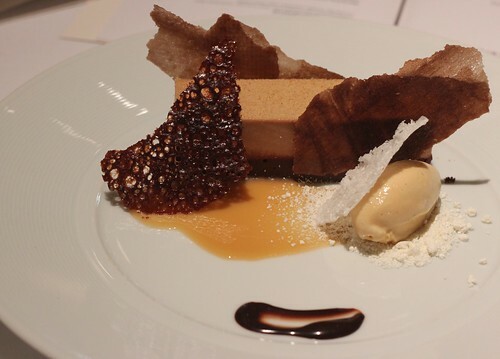 The plate has just the right amounts of chocolate and caramel, you won't be overwhelmed by either. Think you can't afford such goodness? 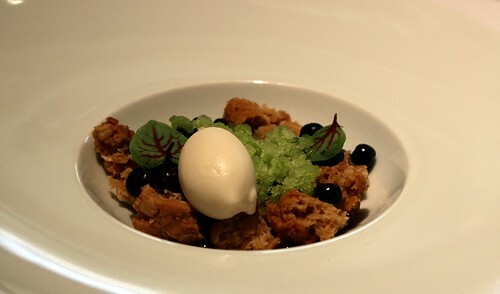 The restaurant is still doing a $25 Greenmarket Prix Fixe lunch currently with the Buttermilk Panna Cotta. Go ahead, be fancy. I missed my 'dessert days' with my best friend before she was diagnosed with diabetes. Hopefully I can bring our dessert days back, if only there are restaurants that make low-calorie desserts. Such mouthwatering treats! I only get to eat these cakes on a fancy restaurant or on a catered event.